If any teacher is the jack of all trades, it is our very own Ms. Shirley Frykberg. Ms. Frykberg is Head of the Science Department, an incredible biology teacher, and, as many people may not know, the self published author of the children’s book titled The Adventures of Craig Crab. She started taking an interest in writing a few years ago, and decided to join a writing class targeted to writing for children. Of course, she picked up the skill unbelievably quickly, and grew to love it even more. Using this as inspiration, she combined the two things she loved; biology and writing, and wrote a book. “I always wanted to write stories where young children could learn about nature,” she said. Her goal for this book was to educate and to teach young children not only facts, but how to love the outdoors. She wanted to inspire children to go out and experience nature on their own. She drew all her ideas from real life experiences in nature. A sequel she is planning about a caribou came to her when she observed the reindeers at Grouse Mountain. It took eighteen months to complete the book from start to finish; cover to cover. People often underestimate the amount of time and dedication it takes to write a children’s book. Ms. Frykberg worked hard during all of her free time along with her friend, and talented graphic designer, Riette Gordon, who was the hand behind all of the beautiful illustrations. The book is about a crab named Craig living in a tide pool. The story follows the crab throughout its adventures, meeting friends, having children and playing games. Along the bottom of each page, readers are asked to identify certain things in the pictures, like anemones. It teaches the children how to identify different organisms in the water. 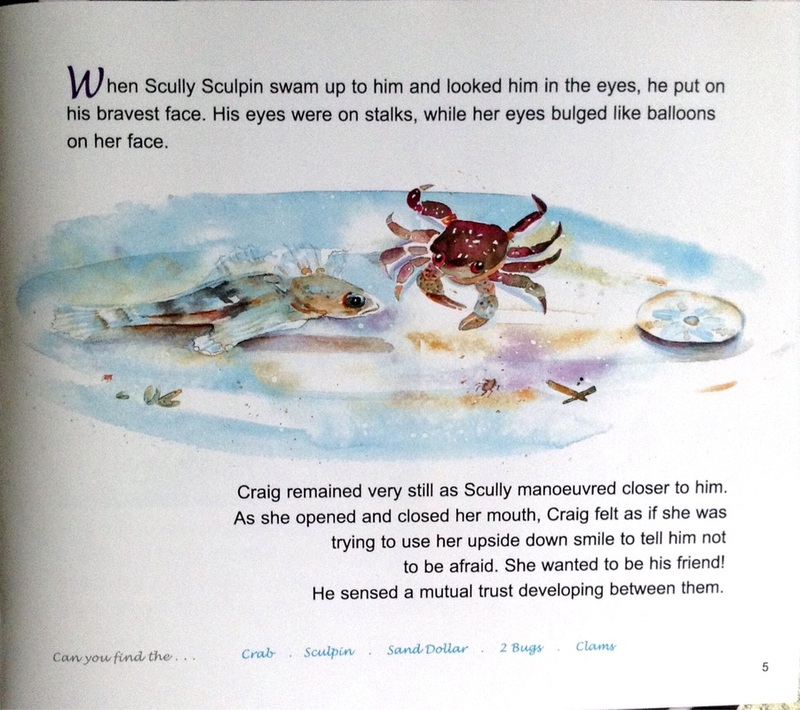 Readers learn about crabs and how they interact with the living and non-living aspects of their natural habitats. When I asked her why she wanted to write this book, her response was that she strongly believes that a respect for nature can solve the world’s social and environmental problems. If more people in the world simply understood how nature affects all of us, most of the world’s problems could be solved. She also believes that nature has a huge impact on our lives. Teaching children to appreciate it at a young age helps them grow up to be more environmentally mindful and careful. Ms. Frykberg is currently working on another two books to carry on the series of animal books. She plans to write one about sea otters and one about caribou to teach children about more than just one creature. We wish her luck as she continues to shape the minds of children through her phenomenal writing and intelligence!